ABOVE: The Serra dei Giardini is on the Viale Giuseppe Garibaldi, slightly inland from Venice's waterfront near the Public Gardens and Biennale grounds. Tourists often talk of visiting places off the beaten path, but in a city like Venice (which attracts more than 20 million visitors per year), the path tends to be well-trodden--at least during the peak tourist months of April through October. 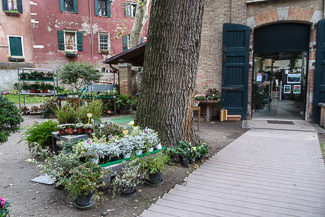 Still, there are a few quiet oases within the bustling city, and one--the Serra dei Giardini--is a delightful place to enjoy fresh air and a snack when you need a break from sightseeing. 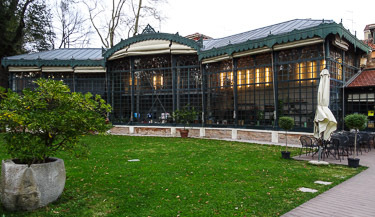 The Serra dei Giardini was built as a greenhouse in 1894. Under its original name, the Serra Margherita or Margherita Greenhouse, it was used to house palm trees and other warm-weather plants. 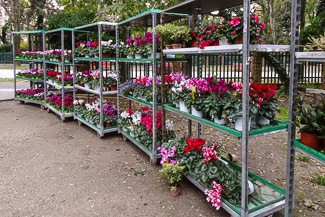 It was closed in the early 1990s and was on its way to oblivion when the city of Venice (which owned the greenhouse) undertook a major restoration project. 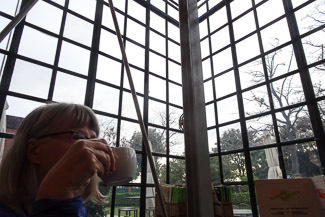 Today, the greenhouse is managed by a cooperative, Nonsoloverde, which sells plants, runs workshops, holds public events, and--of most interest to tourists--operates a delightful coffee bar that is open daily from 10 a.m. to 8 p.m. Turn left into a parklike street called the Viale Giuseppi Garibaldi (not to be confused with the Via Giuseppi Garibaldi) and walk a short distance. You'll see the greenhouse on your right, behind an iron fence and a patch of lawn. For a map, see the contacts page on the Serra dei Giardini's English-language Web site. 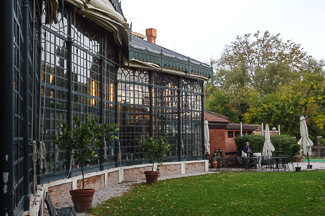 The Serra dei Giardini has a Victorian vibe with its handsome façade of glass and green-painted steel. 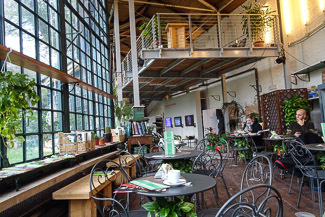 The greenhouse interior is especially welcoming on cool days from fall through spring, when the high glass walls admit the sun while industrial radiators (see below) keep the coffee bar and other interior spaces cozy and warm. 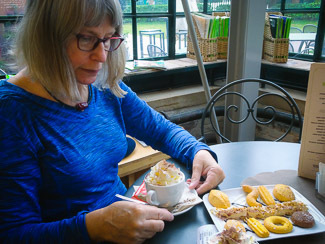 Your coffee, tea, or hot chocolate will be served with a biscuit, but if you're hungry, ask for a platter of mixed Venetian cookies. Juices, sandwiches, and other snacks are also available. 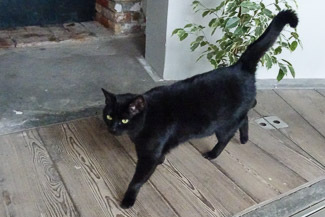 Tip: Take advantage of the restroom during your visit, since public toilets can be hard to find in Venice. The lavatory is in a short side corridor to the left of the tables in the coffee bar. 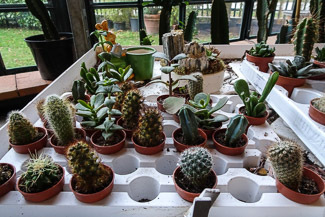 Need a takeaway cactus? The Serra dei Giardini is at your service. Outside the building's north entrance (open doors above) are racks of flowers and other potted plants, for gardeners. The flower shop is open daily except Monday from 10 a.m. to 8 p.m. Since 1997, we've helped 30 million travelers plan trips to Venice, Italy. Copyright © 1996-2019 Durant and Cheryl Imboden. All rights reserved.